Attends Healthcare Products is a pioneer in the incontinence industry with a singular focus on incontinence care. It is a trusted supplier of Attends briefs, protective underwear, pads, undergarments, underpads, and other personal care items which provide superior dryness, healthier skin, odor control, and comfort. Briefs are an everyday, unisex choice offering both ambulatory and sedentary individuals a tailored fit in a full-coverage product. These individuals may choose Attends Extra Absorbent Breathable Briefs when they require superior containment with the additional benefit of breathability: enhanced skin care. This may be of particular concern in cases where the user has delicate skin or reduced mobility. Breathable side panels and soft inner liner provide comfort and promote healthier skin. Cloth-like outer covering for a discreet look and feel. Soft, flexible Comfort Flex-Tabs¿ fasten anywhere for a secure, tailored fit. 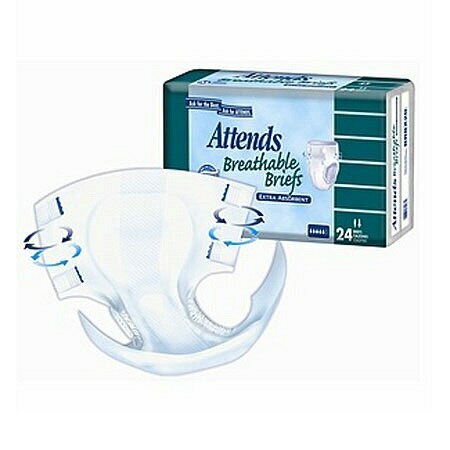 Ships Discreet: Attends Incontinence Products are shipped to you in discreet packaging to maintain your privacy. © 2010 Attends Healthcare Products, Inc.